It occurred to me recently that there are four central tectonic splits within the worldwide political left. Like the tectonic plates that shift beneath the surface of the earth, these represent fundamental cleavages between different tendencies, parties and groups under the broad umbrella of the worldwide left. And, like tectonic plates, these positions clash. The first split is over approaches to globalization. This refers to the major political and economic developments that have taken place over the last 40 years. Economically, it involved the internationalization of the capitalist market economy, following the gradual opening and liberalization of markets (capital, commodity, and to a lesser extent labour) primarily for the benefit of Transnational Corporations (TNCs), which now dominate the global economy. Politically, it involved the gradual erosion of national sovereignty, as increasing power has become vested in transnational political, economic, and cultural institutions, leading some left theorists to argue that globalization has seen the emergence of either a Transnational Capitalist Class (Marxists) or a Transnational Elite (libertarian). Today, the overwhelming majority of the left, either explicitly or implicitly, endorses globalization. A much smaller number oppose it. The ‘globalisers’ aim to reform or even radically transform the global economy, but not to wind it back. To do so, they argue, would be regressive, suggesting that long-held Marxist ideas about the progressive role of capitalism are still deeply influential. The anti-globalisers, by contrast, argue that effective social struggle today, must also include a national component in order to restore national/economic sovereignty, in the face of growing transnational power, which has emerged via the globalizing process of the market economy. A key debate between the globalisers and anti-globalisers relates to the interpretation of neo-liberalism. For the globalisers, neo-liberalism is typically viewed either as the result of misguided/irrational economic ideology (reformists), or as a class-project, designed to restore profitability for the capitalist class (anti-systematic). But either way, neo-liberalism is seen as reversible within the framework of the global economy. For reformists, it simply requires the revival of electable social democratic parties, whereas for (globalist) revolutionaries hope is placed in a, seemingly very distant, global working class revolt. The important point, however, is that neither approach, sees globalization itself, as the core problem to be countered. For many anti-globalisers, such as political theorist Takis Fotopoulos of the Inclusive Democracy project, neoliberalism is inevitably bound up with the globalization process. As he puts it, “globalisation, in the framework of a capitalist market economy, can only be neoliberal.” According to this view, neo-liberalism in fact represents the required policy framework for states that have opened up and liberalized their markets, as most have done over the last 40 years. Once states have done this, whatever their formal ideology, whether social-democratic or conservative etc, they are required to offer competitive conditions – that is, neo-liberal policies – in order to attract investment from TNCs and/or to ensure exports are competitive on the global market. Anti-globalisers therefore argue that the only way neoliberalism could be overcome is if rebel states/nations – in coalition with each other – remove themselves from globalist (neo-liberal) institutions (i.e WTO, WB, IMF, EU, NAFTA etc), and reinstate social (i.e. capital/commodity) controls on markets, as a first step towards greater (if not complete) economic and political self-reliance. This, it is thought, would allow for the effective restoration of relatively egalitarian welfare states. 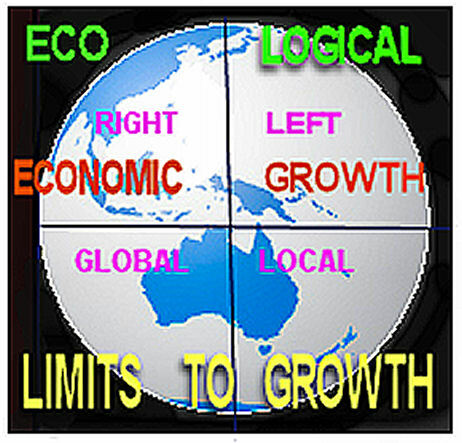 The second major contemporary split within the worldwide left revolves around ecological limits to growth. Those who accept limits argue that a combination of mounting resource scarcities and environmental degradation will soon put an end to future global economic growth and development. Leftists within this school are likely to adopt particularly radical positions. For, unlike many other environmental thinkers, they strive for an egalitarian world order based on fair shares for all. But today the earth is groaning under the weight of human impact and yet only about one sixth of the world’s people enjoy levels of high-affluence taken for granted in OECD countries. In this context, an egalitarian world of affluence for all seems like an immoral pipedream. Theorists in this school, such as Saral Sarkar and Richard Smith, argue for a massive retreat, not just from global capitalism, but also from high industrialism and affluence. This would involve (among other things) an egalitarian planned contraction and reorganization of industrialized economies. But on the left, those who accept limits are in a small minority. Most remain firmly wedded to the productivist/growth theories and ideas embraced by both the liberal and socialist movements in the 19th century. Most on the left acknowledge that environmental issues, particularly global warming, represent major problems, which are unlikely to be resolved adequately within a growth/capitalist framework. But the alternative society they variously envisage typically does not also call into question various sacred cows such as globalization, high industrialism, affluence, centralization, and population growth. These are all typically dismissed as the irrelevant preoccupations of neo-Malthusian doomsayers. When pushed on these issues, (most) socialists reveal their faith in the dominant idea that technological progress, perhaps combined with a more rational socialist/planned economy, can overcome any foreseeable environmental constraints. The last two of the four tectonic splits are far older. There is the long split between reformists and revolutionaries. The reformists seek to change or improve society, by working within and/or modifying the dual institutions of modernity: the capitalist market economy and representative democracy. Revolutionaries seek to overthrow or dismantle these institutions and replace them with alternative ones, such as socialized/planned economies and more participatory/direct forms of democracy. There is also the split between statists and non-statists. Statists, seek to use the power of the state, even if only for a revolutionary transitional phase, to achieve a socialist society. Non-statists reject the state, whether for transitional strategic purposes or not, and instead propose building up alternative institutions/cultures, that could eventually replace the state and capital. Each of the above four splits are theoretically separate. Thus, people on opposing sides of one split may come down on the same side of another split. For example, anti-systemic leftists, while agreeing on the need to overhaul capitalism, may well hold opposing views on globalization. On the other hand, adoption of one position is often closely related to another. For example, almost all leftists who accept ecological limits, usually also oppose globalization, for reasons mentioned above. As it turns out, I find myself adhering to the least popular ‘plate’ in each split. I oppose globalization. I believe humanity confronts severe and imminent ecological limits to growth, and I remain a stubbornly convinced revolutionary anarchist. This leads me to a minority position on the left, advocating for what has been called by eco-anarchist theorist Ted Trainer, ‘the simpler way’ (TSW), which calls for a new society beyond consumer-capitalism, based on individual and collective self-sufficiency, to be gradually built up from the grassroots. Coordinator of New International Bookshop and ‘Simpler Way’ Activist. One of the big problems with neo-liberalism I think can be summed up as the disparity in ability to cross national boundaries. Capital can move itself internationally, far far easier than people can move. As the barriers towards the movement of capital, jobs, business are eroded and the capacity for capital to flit across the world increases, the ability for people to move with it doesn't. So jobs can be exported from a nation at a rapid rate, but the people are stuck. This power disparity gives an advantage to those who can move their assets the fastest. Billionaires can then exercise power in the fact they can move their business faster than the people they employ can follow them. This is an oversimplification, but it represents the basic model, and the problem with globalism. The issue is that free movement of people to this extent is not desirable, as it is socially disruptive for all involved. So anti-globalists are advocating a level playing field, usually by advocating freer movement of people (open borders) and limiting free trade agreements and such. However these will never level out satisfactorily. But all this still occurs in the same ideological mindset, that a country is a business enterprise. What is the purpose of civilisation? Of this human enterprise? Why do we create this? It isn't to create a business, that's for sure, nor to create an impersonal system. I think the Left has lost relevancy because it has systematically and militantly ignored human nature, preferring to put an idealised model of humanity in front of a realistic model. Since at least the 1960's, the Left has pushed an idealism which which on paper seems good, but was not in accordance with the harsher truths of human existence and human nature. The Left to me appears to be in damage control, trying to maintain the idealism pushed, and therefore too busy to effect any real change. Increasing hostility and decreasing tolerance of heresies is more indicative of the state of those seeking to find heresies than those committing them. As a result, the Left is failing (Syriza is a perfect example I predicted would fail) and blaming others for picking up the slack (the corresponding shift to the far right in Greece as a result will be blamed on those who warned of the failure). I oppose globalisation, and am definitely a revolutionary in the sense that the path we as a society is taking is fundamentally flawed. I think the left embody some of those flaws, in particular the means by which truth is determined, which is interlinked with morality. That is, there exists a bias to judge truth based on its conformance with pre-existing moral biases, which is akin to religion or ideology, neither of which is adaptable. The ability to support those biases is fading so the mainstream Left has become less revolutionary and more conservative. Is it working for us?